I had never done a bicycle trip before. Let alone a Pilgrimage. But in 1998, my boyfriend Roger decided to treat us to a cycling holiday. He was a fond cyclist – as many Swiss people are. He had cycled across Switzerland, France, Spain, England, Hungary, Romania etc. He was fit and lean, with light hair, high cheekbones and very attractive buttocks! 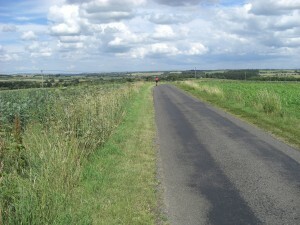 My experience of cycling was the 3Km daily journey from the student accommodation in Oxford to University. And the most adventurous holiday I’d had was a weekend camping by the woods just outside Madrid, where I originally come from. So despite being in my early twenties and eager to do something different and exciting, I was grossly unfit for such a trip. 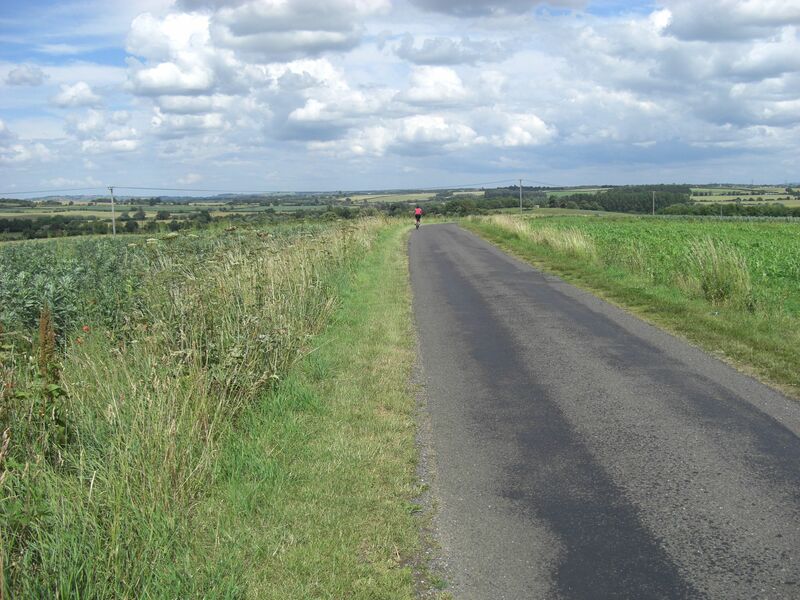 The journey Roger chose was “The Way to Santiago de Compostela” – a traditional pilgrimage of almost 1000Km. We joined the path from St Jean Pied du Port by the French Pyrenees and crossed the North of Spain all the way to the town of Santiago de Compostela, where the Catholic Church claims the Saint Santiago is buried. The first stage of “El Camino”, as it’s affectionately referred to in Spain, involves climbing the Pyrenees and crossing from the French to the Spanish side. That’s what we attempted to do on the first day. The journey started with what seemed like a steep hill, and I remember myself thinking “Ha! This is easier than I expected”. It didn’t take me long to realise I was wrong. We were on the “Route de Napoleon” – a narrow and extremely steep path that goes on for 27Km, across the desolate Pyrenees and without a trace of life in sight. Within 15 minutes the way was so physically challenging that I could not cope. So my first vivid memory of this holiday is vomiting breakfast by the side of the road. Roger was cycling on his old recumbent bike, and carried the heaviest luggage on panniers at the back. At one point the slope was so steep that his front wheel lifted from the road, and he had to come off his bike. I had come off mine long ago. We were completely unprepared for this. We didn’t have any food or extra water – even Roger underestimated the desolation we encountered. And then the fog and the rain started. It rained so hard we could not see two meters in front of us. There was not a soul in sight, no cars no houses. Nothing! I was disoriented, wet and cold. But the physical hardship was not the real problem. What I had to battle with was my state of mind. I was far out of my comfort zone, and became very scared. After what seemed like an eternity but was rather a few hours, I was discouraged and demoralized. Despair turned to anger as I realised that Roger seemed oblivious to the danger of the situation. He had dealt with similar journeys; he knew we would be OK. But to me, the thirst, the lack of feeling in my toes and fingers, and the immense sense of exposure were very real. The difference between Roger’s experience and mine went beyond the physical. I feared injury, hipothermia, and even though I was not that hungry the fact that we had no food or water made me very anxious. I was projecting the situation into the future and making up scary scenarios in my mind. I was feeling my thinking! Roger focused on the practicalities of climbing, keeping our luggage dry, and having to deal with a very grumpy girlfriend. The rain persisted, and the water was getting through to our luggage despite being wrapped up in plastic bags. I was not speaking to Roger – how could he put me through this? For sure he had it all planned! He kept telling me that after a warm shower I would feel much better, but there was no warm shower in sight! As much as I tried I failed to see beyond my dispair. We had been climbing for hours, the weather was getting worse and there was still no sign of life or shelter. At that stage I sat on a rock and said “I’m not moving” – just like a donkey! So we decided to go back down the mountain on the Spanish side of the Pyrinees. I was trembling and tearful, and all I wanted was a dry roof and a piece of cheese! I was so overwhelmed that I didn’t even feel the defeat of turning on our steps. But by the time we had taken a warm shower and were having dinner at a local guest house, everything started to look different – just as Roger had predicted. A warm meal made with fresh vegetables and local cheese. A glass of wine from the region and Crema Catalana for dessert did the trick. We felt energised and uplifted, and laughed about the experience. But I also saw something I never knew about myself. I realised that the fear, pain and frustration I had felt were not created by the circumstances, but these feelings were a result of my thinking about the situation. I was far outside my comfort zone, but the wall I hit was in my head. What is the comfort zone anyway, but what I think I can and can’t do? I knew that if I could ignore those thoughts, I would complete this pilgrimage. The next day we went up the way of Napoleon again, and it was tough on the body but easy on the mind. 12 days later we arrived at Santiago de Compostela. Looking back, the first day on the French Pyrenees stood out as the most demanding, revealing and enriching experience of my journey. I saw beyond my comfort zone. It changed me from the inside out. It gave me the confidence that I could do more than I imagined.